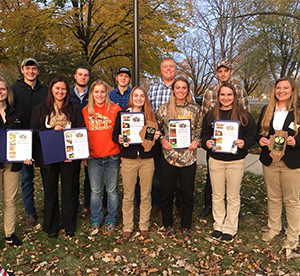 Sixteen Highland Community College Agriculture students recently participated in the Illinois Professional Agriculture Students (PAS) Annual Conference at Lincoln Land College in Springfield, Ill. The conference included competitions in mock job interviews, agriculture sale competitions, agriculture knowledge quiz bowl, and a number of agriculture-specific team competitions that included general knowledge exams, problem-solving scenarios, and current issue student presentations. The students also participated in a business session that elected new state officers and updated the Illinois PAS name from Post-Secondary Agriculture Students to the current title of Professional Agriculture Students. The name change aligns the state organization with the direction of Highland’s national affiliation. PAS is a national student organization that provides opportunities for college agriculture students to experience individual growth, leadership and career preparation through competition and cooperative activities. Students that placed in their respective areas will have the opportunity to participate in the National PAS Conference held March 13-16, 2019 in Loveland, CO. If you have any questions or would like more information about the Highland Community College Agriculture program or the PAS organization, please contact Justin Ebert at justin.ebert@highland.edu or Monica Pierce at monica.pierce@highland.edu. Front Row (Left to right) Michelle Johnson, Madison Folk, Shelby Judd, Kaiti Collins, Shelby Fryar, Kristy Kruger, Katie Hoffman: Back Row (left to right) Matt Holste, Aaron Ackerman, Justin Kalina, Leland Houzenga, Andrew Gustafson; Not pictured – Carli Reeverts, Emily Denekas, Brooklynn Hollis, Lucas Boomgarden.